One way to make sense of new/old foods at the farmers market is to find vintage cookbooks with recipes that predate industrial agriculture. 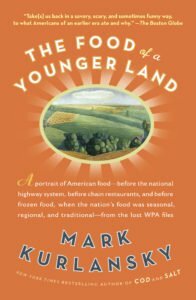 Not quite vintage, Food of a Younger Land by Mark Kurlansky (Riverhead Books, member of Penguin Group (USA) Inc., New York, 2009) is a rollicking tour of American regional cuisine before World War II. You can read it for the recipes and insight into cooking when all food was seasonal, fresh, and local. But along the way you’ll stop for the deeply satisfying cultural essays on early twentieth century America in all its splendid variety. Mark Kurlansky, an award-winning (including for literary writing about food from the James Beard Foundation in 2003 for Salt: A World History and in 1998 for Cod: A Biography of the Fish That Changed the World) author, was doing research in the Library of Congress when he stumbled on boxes containing brittle onionskin typescripts from the WPA Federal Writers Project (1935-1939 Federal program which provided employment for historians, teachers, writers and librarians). The manuscripts belonged to America Eats, the unfinished, unpublished successor to the Federal Writers Program’s regional guidebook series on historical, cultural and economic resources of the United States. Thankfully this skilled writer took up the challenge of completing the project that was literally stopped in its tracks the day the Japanese bombed Pearl Harbor. 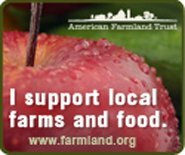 America Eats was conceived by Katherine Kellock as the Federal Writers Project was winding down in 1940. Rather than producing a cookbook, she urged her writers to take an anthropological approach to their regional essays. According to Kurlansky, “She wanted the book to be enriched with local food disagreements, and it included New England arguments about the correct way to make clam chowder, southern debate on the right way to make a mint julep and an absolute tirade against mashed potatoes from Oregon.” The book captures the complex tapestry of ethnic food in America, crossed with regional oddities like the Horn and Hardart automat in New York, squirrel Mulligan in Arkansas, Nebraska lamb fries, Oklahoma prairie “oysters” and ten-pound Puget Sound clams. Kurlansky’s introduction outlines the history and controversies of the Federal Writers Project, which brought together and supported such extraordinary talents as John Cheever, Ralph Ellison and Zora Neal Hurston. By 1940, when America Eats was begun, many of the best writers were drifting away and state organizations were thinly staffed. Nevertheless, the project created a treasure trove of writing that Kurlansky has edited and resurrected – recreating first-person accounts of America before the homogenizing effects of postwar modernism. Rather than recreate America Eats, Kurlansky has presented the most interesting essays along with commentary as required. New York Soda-Luncheonette Slang and Jargon translates 153 hash-slinging slang words into plain English: beans might be called whistleberries or repeaters. Nervous pudding is Jello and two cackles in oink is, of course, ham and cheese. While the essay, Vermont Foods, includes recipes for pickled butternuts, cooked greens, cider plum pudding, and sour milk doughnuts, Italian Feed in Vermont tells the story of around 50 Italian widows of stone masons in Barre who offer a traditional Italian meal for pay, making their dining rooms available for guests to eat and relax in until midnight. Not surprisingly the South is represented by wonderful storytelling and recipes like Sally White Cake from “prominent North Carolinians”– contrasted with Squirrel Mulligan from Arkansas. Zora Neal Hurston tells of the mythical place, Diddy Wah Diddy, where food arrives already cooked and ready to eat. Another writer tells of white-gloved Coca Cola parties in Georgia that are patterned on afternoon teas. The Midwest features essays on farm food, including a detailed essay, Cooking for the Threshers in Nebraska, which would resonate with farm families across America, and a recipe for Indiana Pork Cake just begging for a trial (ingredients include a pound of finely chopped pork, molasses, raisins, four cups flour, cinnamon and nutmeg). Also prevalent are stories and recipes for community gatherings, such as barbecue, the Kansas Beef Tour (an annual feast day in cow country), and Minnesota Booya Picnic (when the Booya is ready to be eaten, the separate ingredients of oxtails, meaty soup bone, veal, chicken, fresh vegetables, and beans have lost their identity- neither soup nor stew, but something of both to savor under the blue Minnesota sky). Though the Southwest section starts with an essay, Iowa Picnic in Los Angeles, followed by A Los Angeles Sandwich Called a Taco, it also includes some interesting essays on native American cooking and pioneer eating in Oklahoma and Hispanic cooking in Arizona. Whether you choose to read this book cover to cover or graze the eclectic mix of recipes and stories, you’ll come away with a new appreciation of the rich diversity that existed before the landscape was transformed by factory farms, super highways and fast food restaurants. To see how America’s culinary diversity has fared since the 1940s, you might check out One Big Table, a portrait of American home cooking by Molly O’Neill.